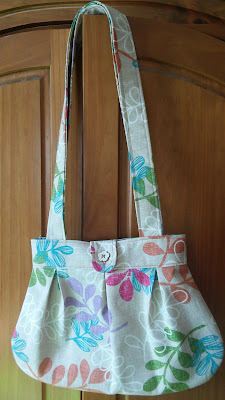 Anya Shoulder Bag Pattern: Tester Makes and Giveaway!!! Claire S, Elisabeth, Jane, Nicola, Sarah, Louise, Claire Corry, Cassandra, Emily V, Abi, Ana Rita, Alyssa W, Amy, and Martha. THANK YOU, ladies!!! Your feedback was invaluable and it helped me improve to the instructions by approximately 1000%. To help spread the word of its existence, I'm going to give away ten review copies of this pattern. To be eligible to enter, you must have a blog and/or Instagram account, but it doesn't matter how many readers or followers you have. You must also promise to make the bag and then blog about it with an honest review, or share your bag on Instagram with a couple of sentences about it (plus use the hashtag #SoZoAnyaBag) within four months. Deal? If you would like to receive a free copy of this pattern and are willing to make, review and share your creation, then please leave a comment in the comments section of this post. Please include what type of fabric you think you'd like to make it in (coz I'm nosy) and if I can't access your email address within two clicks of my mouse, then make sure that it is included in the post as well. Email addresses will only be used to contact you if you win. The deadline is midnight GMT on 4th December 2015. Winners will be chosen at random using a random number generator, and contacted within a couple of days. 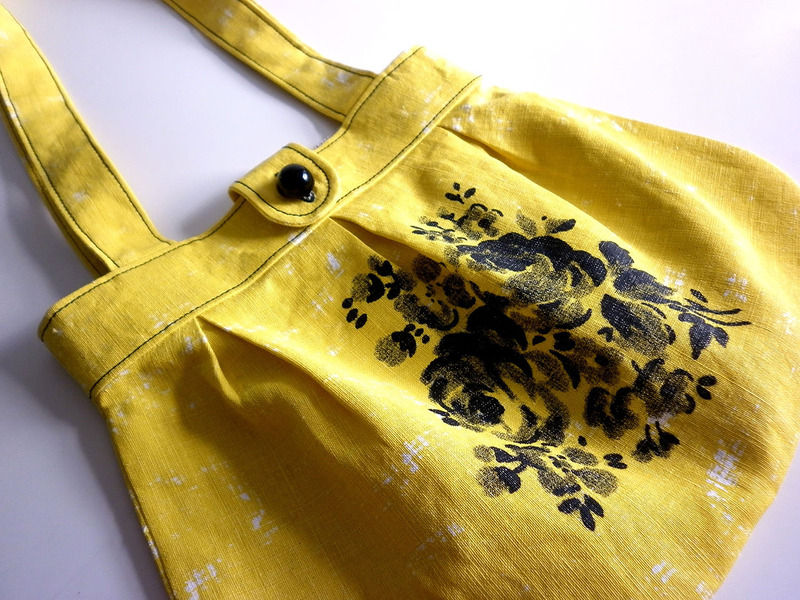 If you have already bought the pattern (or are intending to do so), you are totally able to enter as well. If you win, then I will refund your payment so you'll still be getting the pattern for free. The Anya Shoulder Bag Pattern: On Sale Now!!! Woo hoo!!!!! After a months of work, help from Claire my digitising mastermind and a small army of amazing testers, the Anya shoulder bag pattern is now available to purchase here! Just in time to help you make lovely handmade gifts for your friends and loved ones... And for yourself of course. Named after my daughter's favourite cousin, the Anya shoulder bag pattern is a deceptively voluminous, lined shoulder bag with an optional button tab closure which measures up at 38cm (15") wide and 27cm (10½") high without the straps. It can be made in a variety of woven fabric, from heavier quilting cottons to upholstery fabric and curtaining. 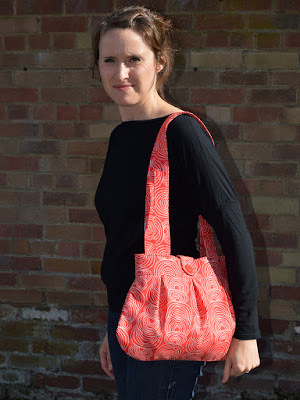 I requires just 80cm (32") of outer fabric and 65cm (26") of lining (or less), so it is an excellent stash buster as well as a great show case for prints and solids alike. 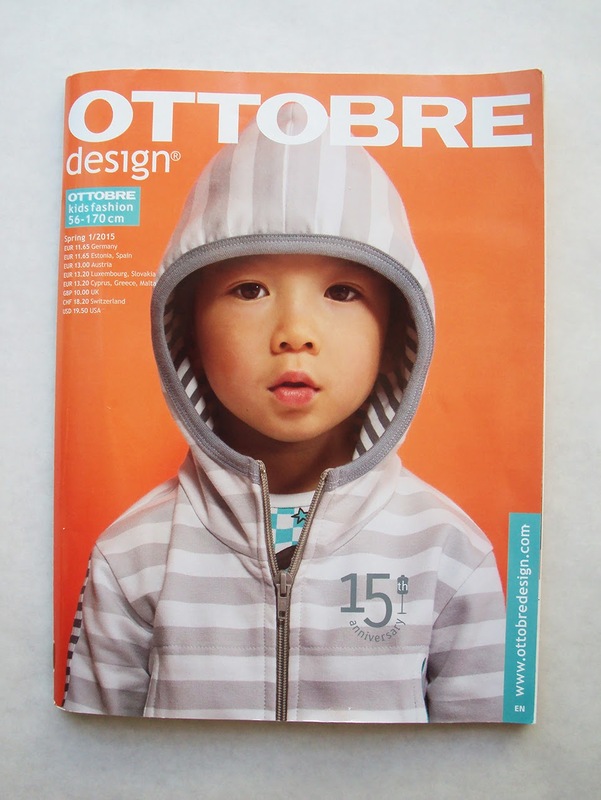 The pattern is sold as two PDF files. The first contains the pattern itself and is formed of only four pages that require printing out. 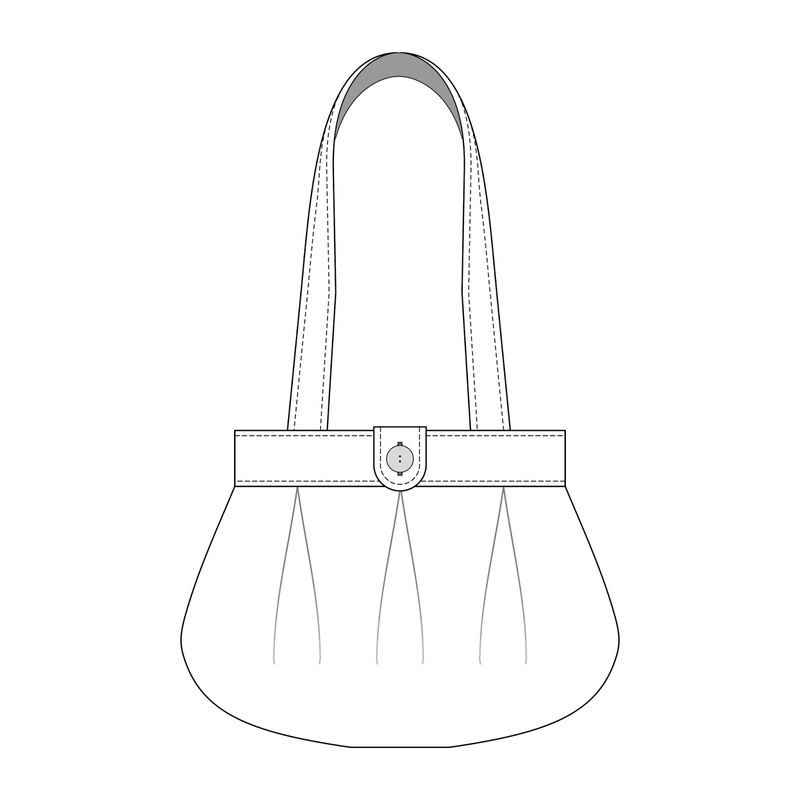 The second file is a detailed 23-page instructions document explaining everything you need to know about preparing the pattern and making this bag. It includes clearly conveyed construction steps large colour photos. You may prefer not to print out the instructions, instead following them directly from your computer/laptop/tablet screen. However, the last page of the instructions document is a condensed text-only version of the constructions steps which you can print out to keep by your sewing machine. This may be useful for more experienced sewers, or for when you have already made the bag before and just need a little jog for your memory. 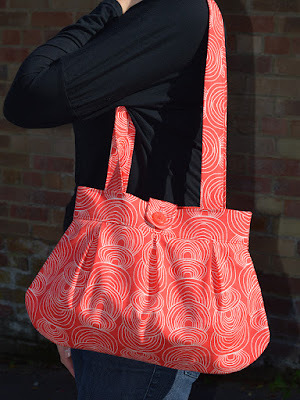 In my next blog post, I'll share with you some of the fabulous versions that the pattern's testers created. You'll see just how cool or cute or pretty or vintage-y it can look when made in different prints, patterns and textures of fabric. 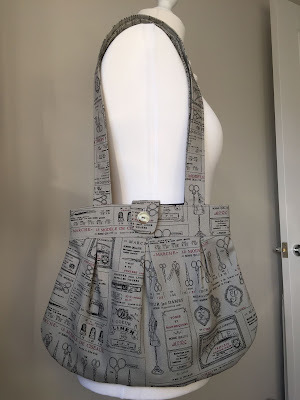 Also in the next post, l'll launch a giveaway to give ten review copies of the Anya shoulder bag pattern to sewists who are happy to make it and write an honest review and post it on their blog and/or instagram. 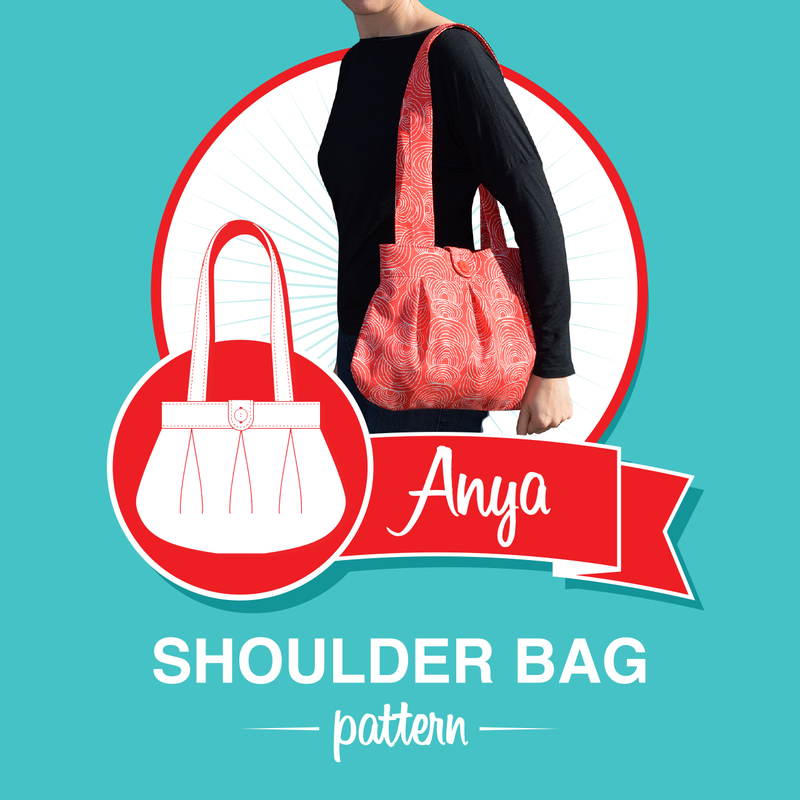 However, there's no need to wait to purchase your Anya shoulder bag pattern! If you buy it, you can still enter the giveaway; if you win I will refund your previous payment so you'll still get it for free. 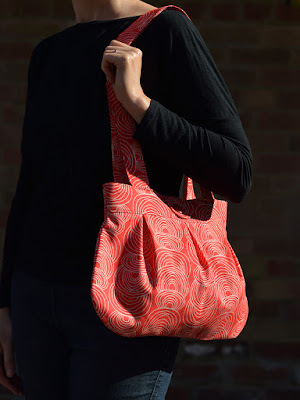 If you have any questions about the Anya bag pattern that hasn't been covered here, please email me at sozoblog (at) gmail (dot) com. If this pattern looks like it might be up your street, then please head over here to purchase it! Having made ten squillion pairs, I'm pretty much over the Playful Kitty leggings pattern from Ottobre magazine 4/2014. Not only was I filling Dolores's wardrobe with them, but because they were so quick to whip up, I made quite a few pairs for her friends when gifts were called for. The ruched detailing of the Green Lines pattern (from Ottobre 1/2014) was a nice variation on the theme, and that almost became my new favourite variant. 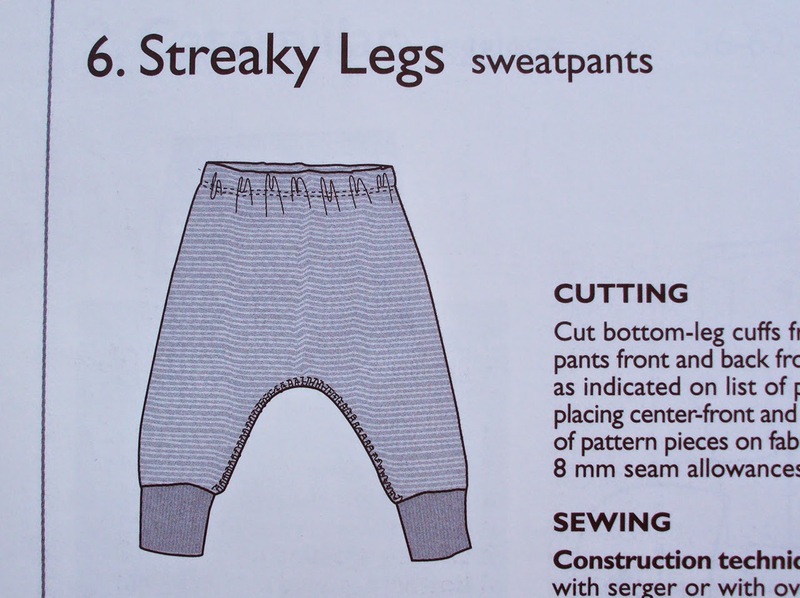 But the Streaky Legs sweatpants pattern seems to have snuck in there and become the one that I reach for when knit trousers are called for now! 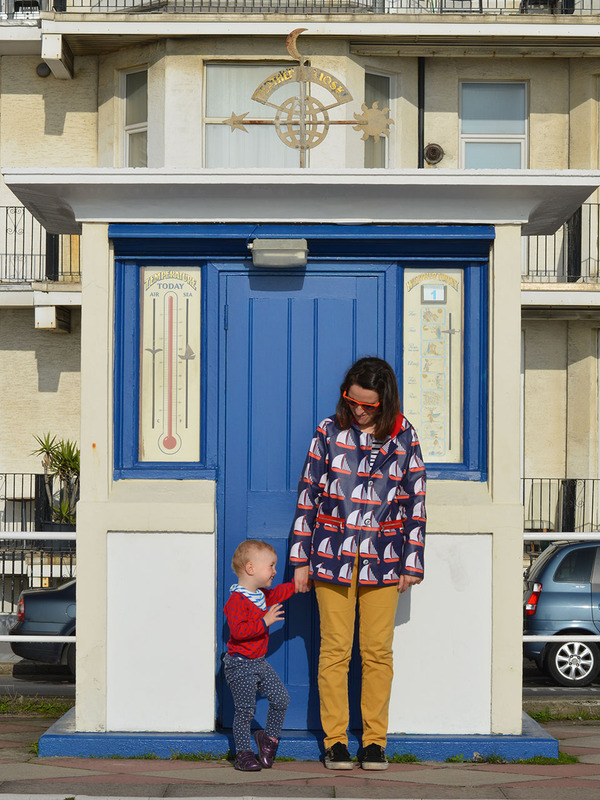 The Streaky Legs pattern from Ottobre 1/2015 (pictured below) is a very casual unisex trouser pattern that goes up to size 92. Because Dolores is a bit skinnier than some kids her height, I used the size 92 for length but the size down (86) for width. This approach worked well during my first foray into making them when I used the size 86 for length but size 80 for width. As I was making that first pair, I felt some concern that the dropped crotch style might be uncomfortable or annoying to wear. Although Dolores's language skills aren't quite up to giving me a full garment review yet, she hasn't expressed any dislike and they don't seem to impede her in any way. 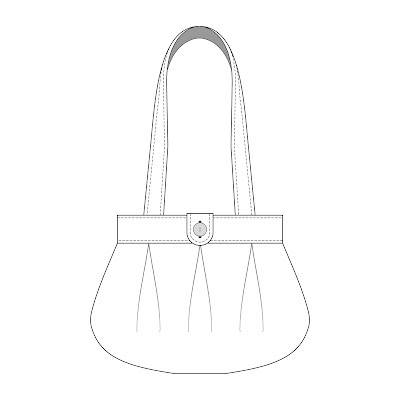 The pattern consists of just three pieces: a front, a back and the ankle cuff. 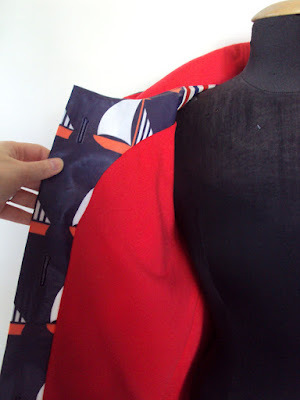 Both the front and back are cut on the fold, but a more economical fabric lay may be achieved by cutting the back piece with a centre back seam instead. I did that with the red rainbow pair you can see in this post. The addition of the CB seam also gives an easy indication as to which way round you should go when getting the wriggler dressed. 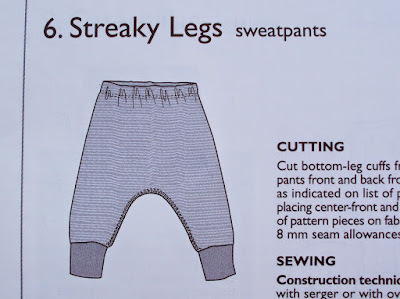 Although designed to be sweatpants, I reckon this pattern could be made in a variety of knit fabrics: jersey, interlock, Ponte de Roma/double knit (BTW, can anyone tell me what the difference is? ), sweatshirting and french terry. Recently we've been dipping our toes in the scary world of potty training, and it is becoming clear that 'separates' pyjamas are going to be much more useful than the all-in-one type that she is busy growing out of anyhow. I always offer her the opportunity to sit on the potty in the morning (TMI for non-parents?!) and I can see that jammies that she can wriggle free from herself are going to lead to more success going forwards. 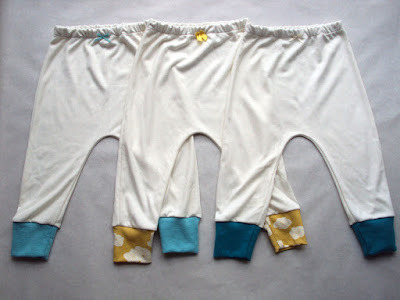 I saw some suitable 'separates' pyjama sets in a charity shop recently, but I decided to leave those for another parent who can't sew to snap up, and went home to search my stash for suitable fabric. The fun thing about sewing pyjamas is that you can use fabric that wouldn't be right for day wear. I probably wouldn't put a toddler in white or cream trousers as they'll become a stained hot mess within seconds, but cream pyjamas are likely to come into contact with nothing more stain-making than a bit of porridge. I made the above joggers for Dolores's friend Arthur's second birthday. 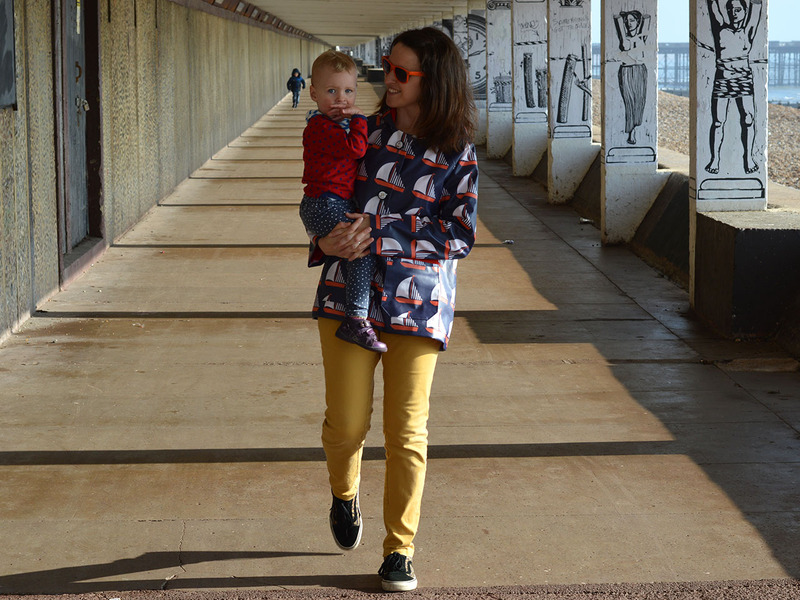 I know that Tanya, Arthur's mum, really appreciates handmade clothing that is well made above cheap shop-bought stuff any day, so I knew I'd be on safe territory with these. The fabric I used was a very small piece of amazing turquoise interlock that was given to me by a student that I taught at one of Tilly's Coco classes. Interlock is basically double-sided jersey, and this fabric was light turquoise on one side and a deeper turquoise on the other. The student (gutted I can't remember her name) used the deeper tone for the body and sleeves of her Coco top, and the lighter tone as contrasting cuffs and collar, which looked a-mazing. 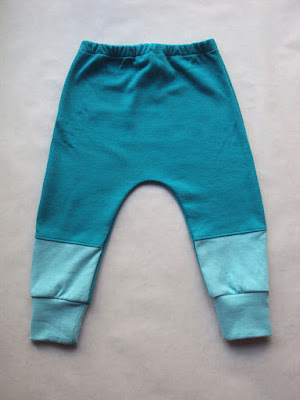 Following that student's lead, I planned to use the deeper tone for the trousers with the lighter tone for the cuffs. However, I couldn't quite fit both the front and back pieces on the remaining fabric, so necessity being the mother of invention and all, I had to make the front piece with panels so I used the contrasting tones for some cool colour-blocking action (seen more easily in the above picture). I literally wouldn't have thought to do that if I hadn't had to! I topstitched the seam allowance down where the panels join so it wouldn't feel too annoying around Arthur's knees, and I really like that row of visible stitching. Ages ago my best mate bought Dolores this phenomenal 1970s-esque rainbow batwing top (it's from the Little Bird range, before you ask). It's still a little big but I'm determined to get maximum use from its awesomeness. 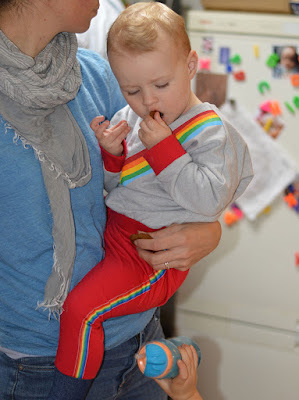 I love rainbow elements on clothing and was inspired to make a cosy pair of joggers that she can wear with this top featuring even more rainbows! 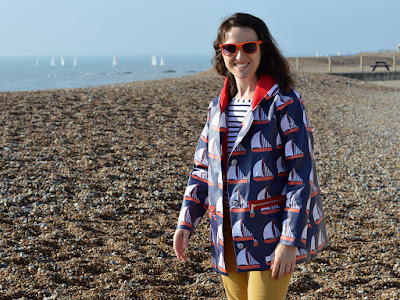 Using left-over scraps from the Girl Charlee sweatshirt lining of my sailboat raincoat, this is the warmest and snuggliest pair I've made from this pattern to date. 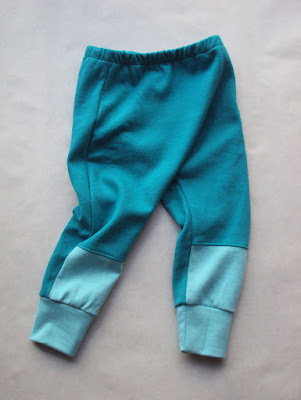 The sweatshirt fabric, however, has very little stretch so after cutting the cuffs from the same fabric, I abandoned them as I don't think she'd have been able to get her little feet in and out! 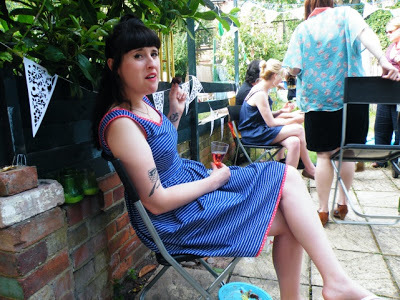 Instead I found a scrap left over from the best denim skirt ever made by me, which is way stretchy enough. 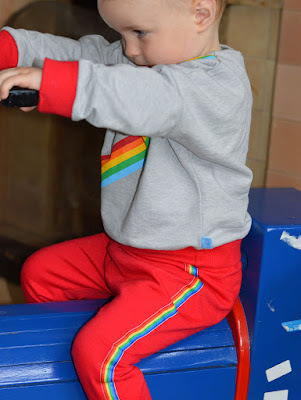 The rainbow trim has been in my stash for longer than I remember, and I simply stitched two lengths down the side covering the side seams. I LOVE the combo of red, denim and rainbows! It reminds me of a childhood spent watching Sesame Street! I'm really happy with all these versions of this pattern, and have almost got it out of my system now. When a pattern has to be traced out, like the Ottobre ones do, I feel it is a waste to only use that pattern once. I may have gone too far in the other direction now! But it is fun to see how one pattern can make such different looking garments, for different uses or to be worn by different people. However, I'm now using the largest size of this pattern (92), so unless I dabble in some pattern grading, I'm going to have to move on to a new pattern obsession soon. Hurrah! Everything came together to make five useful toddler garments for nothing but my time and energy, and the power needed to run my sewing machine. What about you? 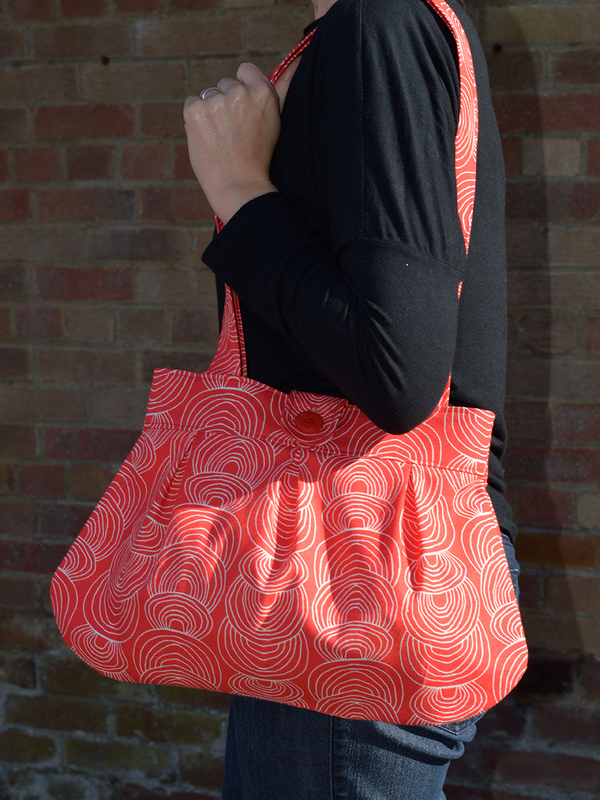 Have you fallen in love with a quick and easy sewing pattern recently? How many have you made and do you have more lined up? Can you recommend a simple pattern that is great for making gifts, either for kids or adults? Recently, I've been thinking a lot about, and working towards, a better functioning and more sustainable wardrobe. I once read a statistic that women generally wear 80% of their clothing 20% of the time, and 20% of their clothing 80% of the time. I reckon that many of us can relate to finding a large selection of clothes when we open our cupboards and drawers, but still we tend to put on the same handful of things again and again. I also read (possibly in this book) that women today own on average twice as many items of clothing as women did in the 1980s. Do women nowadays need twice as many clothes? I can't imagine so. I can't see that we have double the social or familial roles, for example, that may require so many more outfit options. 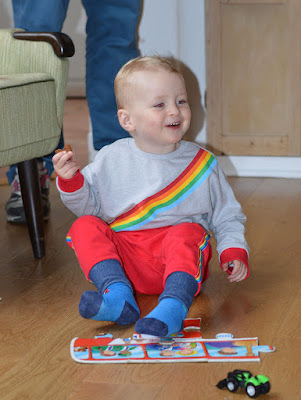 I don't think that owning twice as many tops as our mums did at our age makes us happier, or makes it easier for us to get dressed in the morning. This always sounds like it's going to be easy, doesn't it?! But it's amazing the emotional attachments we develop with our clothing, especially if we made the damn thing ourselves. When you've chosen the fabric, painstakingly cut everything out and stitched every single stitch yourself, the investment of time and money you put into that garment can make the ties very strong, even if we know that we're not going to wear it again. However, I've managed to be pretty brutal in this area recently. Admittedly, some of the stuff has gone to the half-way house of the refashioning/remaking pile if I think that the fabric can be salvaged for something else. I know that for some people, being surrounded by lots of stuff makes them feel secure, but for me it can feel claustrophobic. Having less stuff makes me feel unencumbered and freer to take advantage of whatever life may offer me, including on the very practical level of being able to move house/city/country easier if that is what I choose to do. I must also admit, that the concept of owning lots of 'stuff', including clothing, that you rarely use feels really uncomfortably 'hoard-y' and selfish to me. I can't help but associate a greedy, childish 'mine' kind of mentality to this behaviour that I feel is really damaging to society, as well as to the environment which cannot support the accelerated levels of manufacture required for the excessive acquisition of products. To donate my unworn, me-made clothing to charity shops (whether they are then deemed appropriate for resale so that others can buy and enjoy them, or if they then get sold on as rag to be shredded, processed and recycled), can be hard but also cleansing. Thinking about going through what garments I have, finding new outfit combination to wear it in, and then actually wearing it, as part of sustainable approach to clothing dawned on me embarrassingly recently. I was getting caught up in what I didn't wear and what I might make to wear, and had somehow forgot to concentrate some attention to what I already have to wear. Wow, did I feel stupid! I don't expect to able to wear 100% of my wardrobe 100% of the time. There is my wedding dress, some special occasion/fancy clothes, and some very seasonally-specific clothes that realistically have very limited usage. But everything else needs to worn semi-regularly to earn its keep. 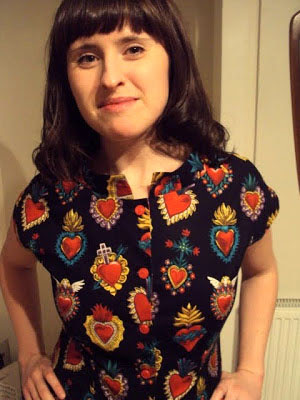 I recently started wearing my corazones rockabilly blouse (pictured above) more often, and it has received an insane amount of compliments at the playgroups! Not that my aim was to garner compliments, but of course it is nice! 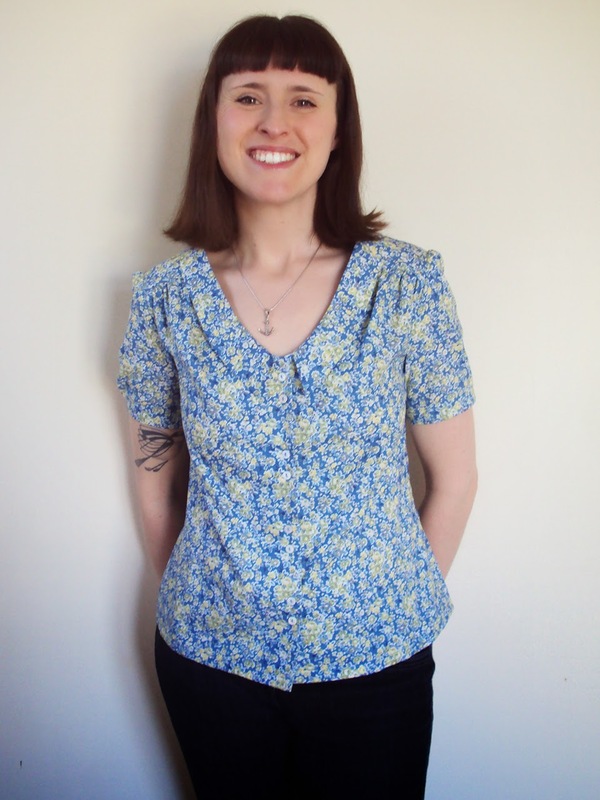 Challenges like Me-Made-May are great for prodding us into wearing the (specifically, self-stitched) clothes that we have but often forget about. Bringing those practices into the rest of the year is what I'm trying to do now. This usually the most boring one, isn't it? My personal trick is to do one altering or mending task in between every 'started from scratch' sewing project. That's the only way I can rev up the motivation. Oh, that and by telling myself that I'm pleasing the Sewing Gods by fixing something that's a bit off. 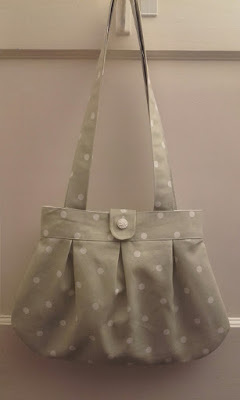 Then hopefully they will, in turn, bless me with a successful subsequent 'from scratch' sewing project! It sounds perverse, doesn't it, to prefer to start a new sewing project, and invest all the time and effort that that will entail, rather than setting aside half an hour to fix something that I've already invested heaps of time and effort into? Tell me I'm not alone! It reminds me of a friend we had called Max back when we lived in Barcelona. She hated the flat she lived in and was always moaning about her flatmates. But she admitted that she would rather moved countries than find somewhere the other side of town and go to the effort of moving in to it. Possibly the most fun of all the aspects of creating a 'sustainable wardrobe', as I see it. I've already talked about my own personal sewing projects that I have a good idea will actually get worn in my nippy weather sewing plans post. As we get older, (hopefully) we get more of a sense of who we are and how we want to present ourselves to the world. And specifically to clothing, what we like to wear and what suits us (colours, silhouettes, fits, fabrics, textures, fibres) tends to 'stabilise' and not swing violently from one trend to another, or perhaps one subcultural identity to another. Obviously, people's taste continue to evolve, often in response to if not a reflection of popular culture. But slowly and occasionally adding to and updating a wardrobe with new pieces (shop-bought or self-made, or both) has got to be a more sustainable way to go about dressing than reinventing yourself every year or few months, as many teenagers (myself included!) are prone to do. This isn't meant to come across as an attack on the youth, however! Learning who you are through the prism of how you dress is an essential phase that everyone must and should go through, I would argue. But having come out the other side of that experimental period, it makes planning sewing projects that are likely to get worn regularly much easier. I would LOVE to know what your thoughts are on creating a 'sustainable wardrobe'. What would be your ideal selection of clothing? What motivations effect what you make/buy? How often do you purge the things you don't wear? Do you enjoy a large selection of clothes, or does it annoy you? 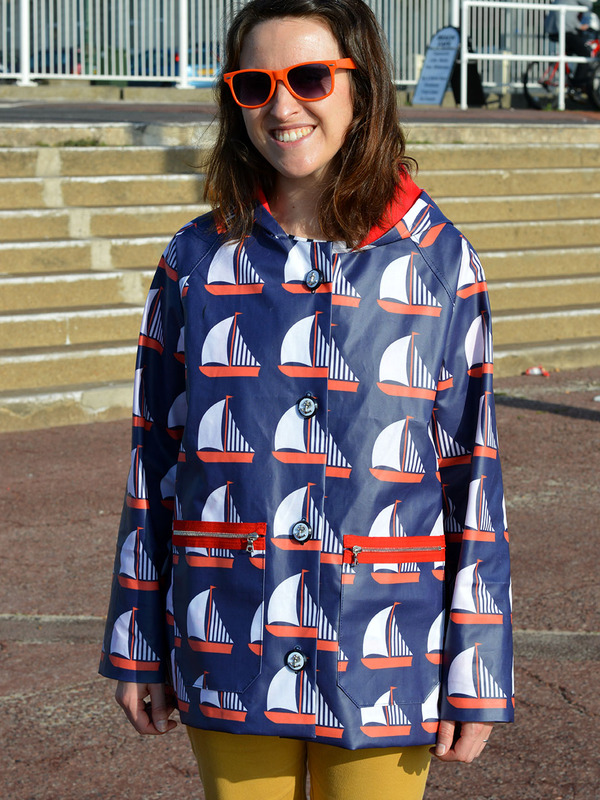 I made a freaking raincoat, people! I'm more than a little amazed at myself. Not because I'm wowed by my skillz, but because I never thought I'd need to own one, much less devote hours of precious sewing time to making one. See, the thing about me is that I really like being indoors. My main hobbies (sewing, eating and drinking) all usually take place inside. However, now that I have taken on the role of Primary Entertainments Director for a busy toddler, these days I'm finding myself outside MUCH more than I am naturally inclined. 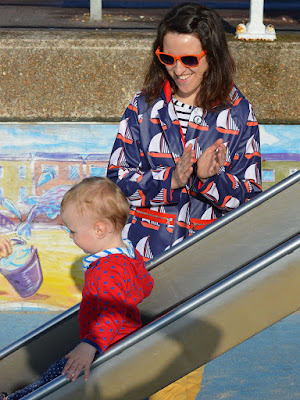 Then, whilst I was casually window-browsing through my blog sponsor Sewbox.co.uk's extensive sewing pattern selection on a train journey, I came across the Papercut Pattern's new Waver jacket pattern. I thought, 'Stop the search'! It had a hood, it was lined, it looked good with phone-and-keys-sized patch pockets, and would probably be a suitable silhouette for a stiffer fabric. Susan, who owns and runs Sewbox.co.uk, is such a lovely generous lady, so I chanced my arm and asked if she'd send me a copy to review. Bless her, she did! I haven't sewn with a Papercut pattern before, but I am familiar with their beautiful and unusual packaging. It is a very nice thing to own in its own right, however the larger sized envelope doesn't fit in my sewing pattern storage boxes! The pattern sizing suggested I was a Small, however I decided to make the Medium so I could cram lots of layers underneath. This was NOT intended to be a clement weather garment, after all. I didn't bother to make a toile/muslin because A) I didn't have anything suitable to toile it up in to hand, and B) I just couldn't bring myself to spend more time on this project than making a coat is already about to take. The result has come up a teensy bit big (funny that...), but I'd much prefer that than it feeling a bit snug, especially around the arms. The instructions were great, with clear illustrated diagrams. The only bit that I stumbled on, and felt could have been made clearer, was a bit where you stitch the bottom of the hem turnings to the bottom of the front facings after you've stitched the lining in. I feel I understood what they were asking me to do, but the half-made garment in front of me didn't reflect was I was meant to have to work with at those points. I still don't know if the mistake was a pattern drafting one or my own, and I do not possess sufficient patience to stop, take a photo of the issue, email it with my query to the pattern company, and wait for a response. I made a stab at it and those points look slightly fudged, but generally it worked out fine. I'd love to hear anyone else's experience of that bit. The only real change I made to the pattern was to I add zips across the tops of the patch pockets. I figured I didn't want my pockets filling up with water during a rain storm, particularly if my phone was in there. I considered making pocket flaps, but that would throw up even more pattern matching issues than I already had (more on that below), and I liked how the red zip tape breaks up pattern on the front and matches the hood lining. One of the reasons that I had been stalling with attempting a raincoat project was that I just didn't know what type of fabric I would need to buy, or where to buy it. I certainly didn't have anything suitable in Le Stash (always the first port of call, of course). And then one day I went to work to teach at Tilly's HQ, as I very often do, and a company called Anorak who are based in Tilly's building was having a sample sale in the foyer. I had got there a bit early so had a wander about and I found some lengths of this sailboat printed plasticised fabric for sale. I was all like 'WHAT?! 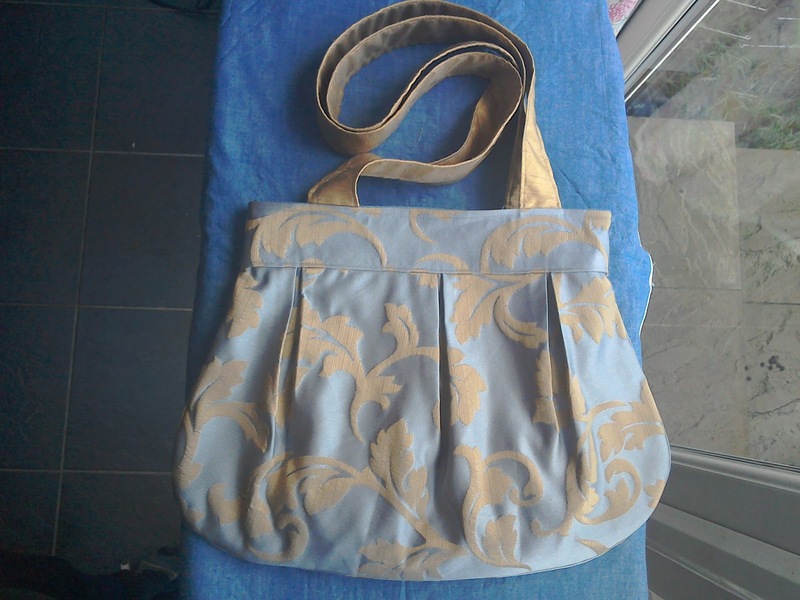 ', and bought two lengths (about 2.7metres in total) for £15. I have no idea what it is (I should have asked) but I'm guessing its some kind of laminated cotton or something? It's the kind of stuff that you'd use as a table cloth for picnics or if you have toddlers, or perhaps for bags, but easily thin enough to sew little trouble. So with such a bold print, you'd think I'd spent a whole chunk of time carefully placing the pattern pieces onto it? NOPE. Not at all. 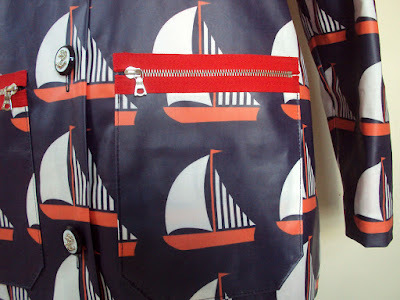 The only nod to pattern matching was my attempt to align the rows of boats horizontally at the side seams. I just simply couldn't be bother to make my head hurt with it all. Remarkably, I've got near-perfect completed boats at the centre front. In the photo at the very top of this post they look wonky, but I think that was just how I was standing! They look fine IRL. For the pockets, I just made sure each one had a boat slap bang in the middle of it, and didn't fret about how that then matched, or didn't match, with the rest of the print on the front pieces. 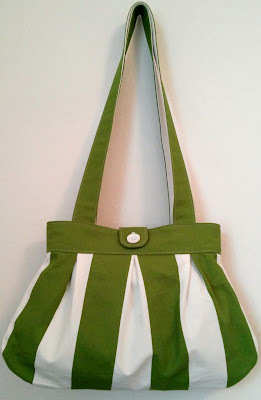 Not knowing exactly how the hell I was going to sew it, I researched 'sewing with vinyl'. All the info seemed to be advising about using stuff much thicker and weirder than what I was about to deal with, so I popped on my walking foot onto the machine, chose a thickish sewing needle, manned up and got on with it. I even pinned the seams together rather than using clips or something, I just made sure that all the pinning happened within the seam allowances to prevent any puncher holes from showing. I didn't have any problems making buttonholes through it either. I could even press it with my iron on a low setting and sandwiched between a pressing cloth. One thing I did do differently was topstitch down all my seam allowances. I know that the seams of wet weather gear are often taped to make them fully water proof, but I don't plan to get that wet in this thing, plus I didn't want to make the seams any stiffer. I felt that glueing the seam allowances down would get too messy, so I opted to top stitch every-damn-thing. It definitely took longer, but I like it as a detail, I think all told it looks more sturdy. I also omitted the interfacing on the front facings as I wouldn't be able to get my iron hot enough to properly fuse it on. And because I didn't want the waterproof stuff against my neck, I used a scrap of nautical stripy woven cotton for the back neck facing. As I say, I think this stuff was probably intended for furnishings or bags rather than clothing, and although the fabric seems to be functioning pretty well in its new role, I think it'll age pretty rapidly. Every time it gets creased or scrunched up, it leaves a slight pale mark along the crease line. Time will tell what it ends up like! I spent some time weighing up my lining options. Do I go for a regular shiny jacket-type lining? Perhaps a flannel/brushed cotton for extra warmth? Most of Dolores's coats seem to be lined in either fleece or jersey, which seemed like a good idea to give cosiness and comfort for adult casual outerwear as well. Then I hit upon an idea: what about sweatshirt fabric? A quick internet search and one email later, and I was hooked up by Girl Charlee with 2m of red cotton sweatshirting, gratis. That may sound super cheeky, but after they provided me with some jersey and Ponte de Roma recently to blog about, they said to let them know if I ever wanted any more fabric. Well, if someone's going to tell me that...! It arrived super quickly and was just what I needed for this project. Shortly after requesting the sweatshirting, I had a panic. What if it was too thick? I didn't want to disable my arms with a layer of stiff plastic-y bag fabric and chunky sweatshirt fabric! 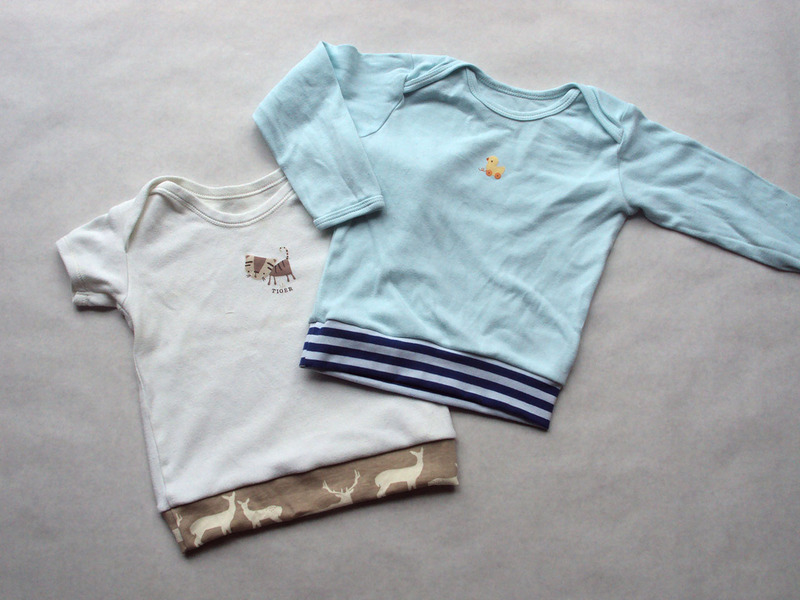 But when it arrived, it actually turned out to be a thinner variant of sweatshirting than I've used in the past. The listing states 'medium weight', but to be honest, I would have found it a little thin if I'd intended to make myself a cosy sweatshirt from it. 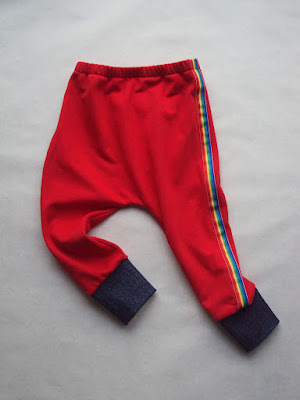 However, for children's wear or lining like this, it is exactly what I would look for. I bought these plastic anchor buttons from Istanbul, of all places. Pat and I went on a little holiday there with both our mums (or mams, if you're northern, and my mother-in-law is) years ago before we got married. I think the shop was actually a wholesale button seller, but they kindly agreed to sell me just eight! I like how the silver anchors echo the silver teeth of the pocket zips. Unlike the other two coats I've made (this leopard print one and this navy wool one), I experienced a strange feeling at the end of the project. 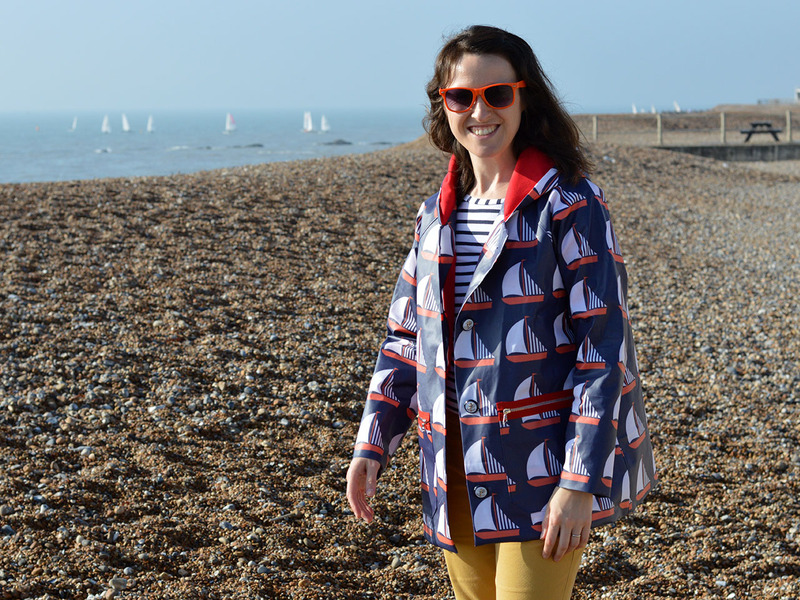 Or rather, I didn't feel a predictable feeling: the desire to never make a coat ever again! I actually felt like jumping straight into another coat project. Bizarre. I won't of course, I've got far too many things on my 'nippy weather sewing projects' list that make way more sense to complete first (not that sense or logic usually influence my sewing plans). Somehow, this coat managed to provide the satisfaction of completing a 'meaty' sewing project, but without the excessive faff and annoyance of more complicated coat patterns. As you can see from these photos, finalising this raincoat project immediately brought out beautiful sunshine. It has remained pretty mild and dry ever since, so I have yet to 'properly' wear this out in the wilds (or the park). What I can say so far is that it feels cosy. It really feels like wearing a jacket and a sweatshirt on top of whatever else I've got on. I would definitely choose a sweatshirt fabric to line another coat or jacket, if the style was casual enough. 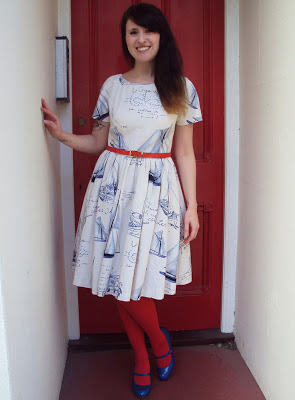 I could also see myself using this pattern again, I love the gathered waist version. Not bad for a raincoat! A quick internet search brought up similar (but not as awesome) for around £80. 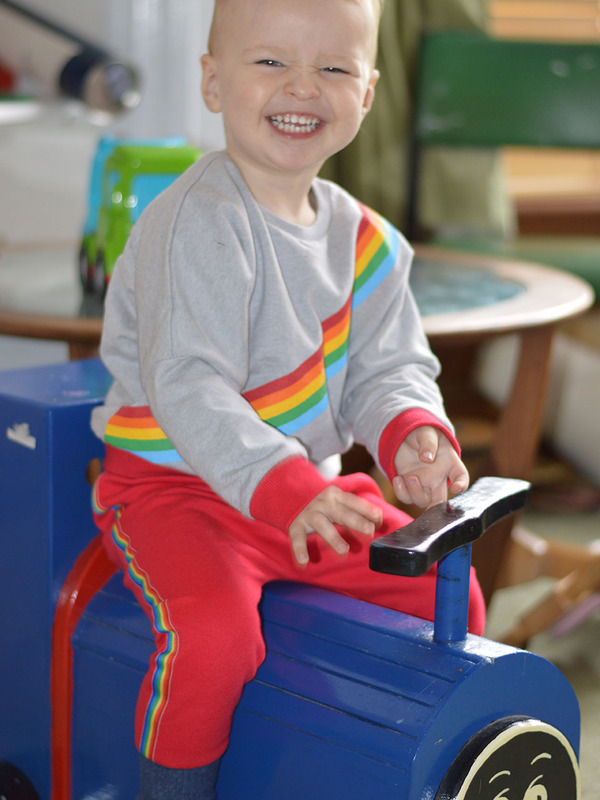 Massive thanks to Sewbox.co.uk and Girl Charlee for their generosity. What about you? 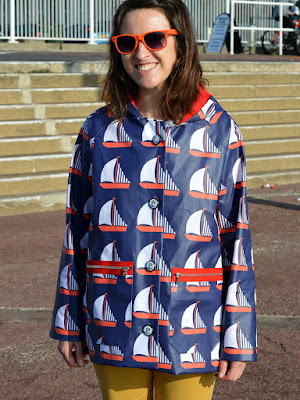 Have you ever made a raincoat or used fabric similar to this (whatever 'this' is, exactly!)? Do you relish or despise coat making?